From the traditionalists to the rule breakers, we help our couples express their true selves. Shirley & Michael \\ Shout it from the treetops. This design inspired by the couple's personal art collection. Sallee \\ Living on the edge. Quarter inch thick gilded menus for a destination wedding in Instanbul. Elaine & Landry \\ Blushing at InStyle Magazine. Another lovely save the date featured today: "If you're looking to break the mold, consider a unique shape - skip square and rectangle for die-cut shapes like this one from RedBliss Design, which also shows off the hot trend of rose gold foil-stamping." Ellie & Ty \\ Save the date at InStyle Magazine. This beauty featured today: "Three dimensional textures are super-hot in weddings and offer a touch of glam to even the most simple paper moment. 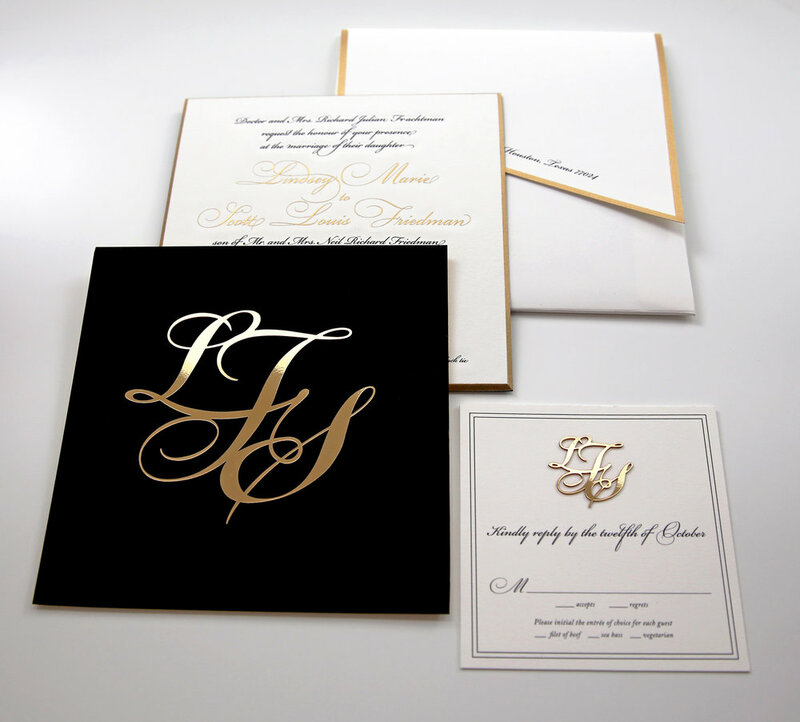 RedBliss Design specializes in laser-cut metallic details..."
Molly & Eric \\ Gold and black is just so good together. Topped off with a little Chroma monogram. 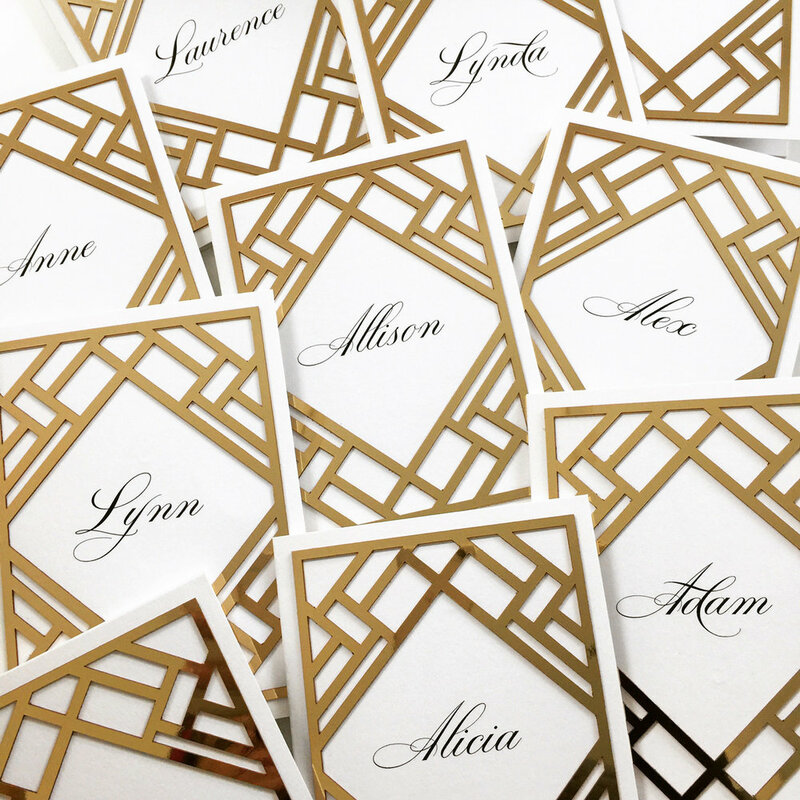 Leslie \\ The custom menus we designed were laser cut and then calligraphed in gold. The bill of fare was foil stamped on the other side. Named Harper's Bazaar Coolest Wedding of 2016. Angelo & Frederick \\ City chic. Laser cut gold Chroma layered on black acrylic. Table 11 \\ Lucky table 11. Our shiny and bright custom Chroma deco-styled table number. Michele & Christopher \\ When summer meets romance meets New York City. 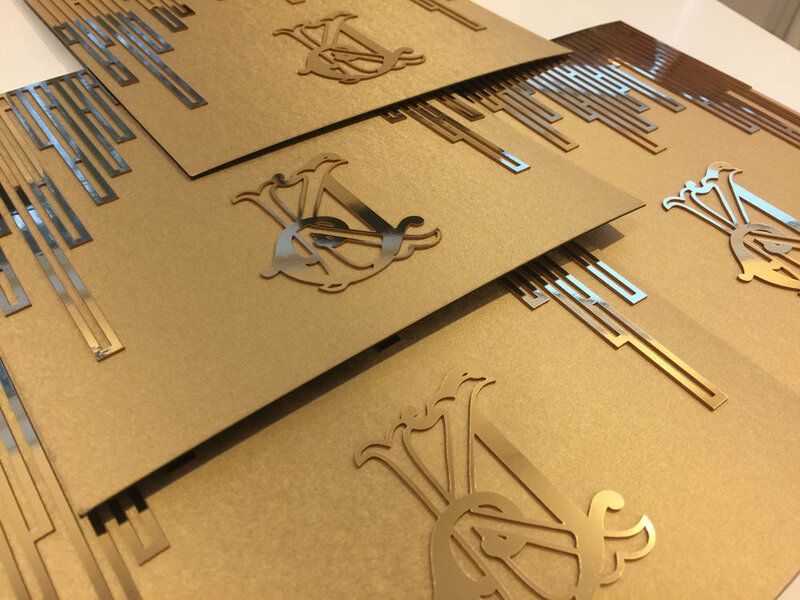 Letterpress invitation + Chroma skyline + foiled envelope = oh my! Emma & Falan \\ Our first 3D-printed invitation! Peaks of the printed piece with a gold Chroma invitation slipped inside. Sara & Saatim \\ Sitting pretty! The rose laser cut pattern was inspired by the brides dress. Lindsay & Scott \\ There are some clients so kind, you wish they had 10 more children. It made creating this wedding invitation that much more special for us. It was a beautiful blend of traditional elegance and modern sophistication. Engraved, beveled and monogrammed in Chroma. Kim & James \\ Kim and James had their own golden moment. Shirley & Michael \\ On point. Inspired by the Rockefeller Center Art Deco Frieze and designed using laser cut precision. Personalized Menus \\ Finding your seat at The Grill in NY looked a little something like this. Personalized menus framed in Chroma. Karen \\ A little edge + a lot of elegance. The epitome of personalized modern romance. Lena & Erik \\ Give them menu envy. Kelly & Barry \\ Any way you frame it, modern can be glamorous. Dana & Daniel \\ Every client has a story to tell. And we love helping them tell it. Always in their own way, without rules and full of personal touches. This couple embodies this...in love with each other and The Life Aquatic. We even included a little submarine. Jordyn & Etai \\ See what inspired the design of Jordyn and Etai’s wedding invitations ...the iconic St. Regis Bal Harbour entrance! Congratulations on tying the knot yesterday you two. Eric & Darren \\ When you work with the nicest couple with the chicest style, their wedding appears in Town and Country Magazine. So proud that the invitation and monogram we designed became such beautiful design elements for the entire celebration at the Rainbow Room.